The value of “Going Digital” is well known. The benefits include the elimination of wet processing chemicals, the reduction of retakes and the consistent production of high quality images. However, users may often be concerned with the learning curve often associated with new technology adoption. Nano CR eliminates these concerns. 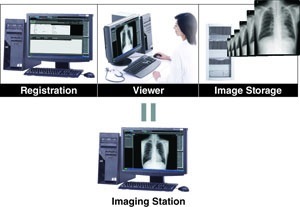 The built in intelligence of this system allows first-time users of Computed Radiography to produce consistent, high quality images out of the box with minimal instruction. 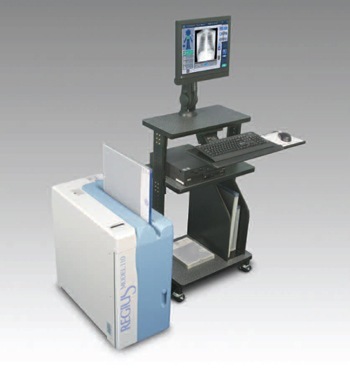 Now you can convert your private practice to digital radiography with the Konica Minolta Regius Nano P system. It is a high performance system that offers compact size and dependability! Processing 60 (14"x 17") plates per hour, the Konica Minolta Regius Nano P lets you take care of more patients in less time. The Konica Minolta Regius Nano P features intelligent control station software with auto recognition and self learning capabilities. You will be able to generate high quality diagnostic images with minimal training and fewer steps for improved workflow. Patented, rigid image plate is contact free within the CR Reader eliminating the potential for image artifacts and extends the life of the plate. The Regius Nano-P CR system is a high performing dependable system in a compact size. Processing 60 14x17 plates per hour, this CR allows you to take care of more patients in less time. The Nano-P CR features Konica Minolta's newest CS-2 intelligent control station software with auto-recognition and self-learning capabilities. It is a simple to use CR system that automatically recognizes each exam view and applies the processing algorithms appropriate for each image. You'll be able to generate high quality diagnostic images with minimal training and fewer steps for improved workflow. Dimensions: Width: 29.1" Depth: 14.4" Height: 29.4"
ImagePilot CR is an innovative all-in-one digital radiography and medical imaging system, designed specifically for private practice facilities, that integrates a complete yet simple CR imaging workflow solution. ImagePilot CR makes the transition from analog to digital quick and effortless by combining multiple functions into one intuitive, easy-to-use system. Now you can easily convert your practice to digital radiography with the ImagePilot CR System. This single system solution is specifically designed for private practice offices and clinics. 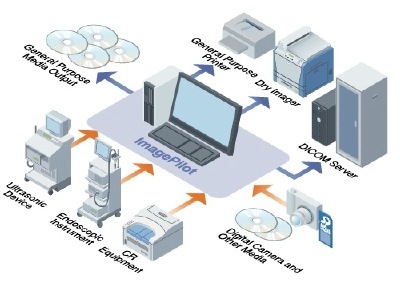 ImagePilot CR is the newest technology in CR imaging. It simplifies CR image acquisition to the push of a button. This is made possible by AutoPilot Image Processing which completely automates the image optimization process. With AutoPilot, you get consistently superb images with every exposure. In addition, ImagePilot pioneers the true meaning of an integrated CR system. 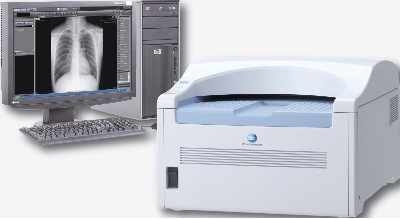 It combines patient registration, CR acquisition, image viewing and storage in one system that is easy to use and maintain. These advanced features eliminate the need for a separate PACS. Designed specifically for veterinary practices, that integrates a complete yet simple CR imaging workflow solution. ImagePilot CR makes the transition from analog to digital quick and effortless by combining multiple functions into one intuitive, easy-to-use system. The REGIUS 110 is a high performance single bay CR system that can process up to 76 plates an hour for fast patient turnaround time and improved workflow. Its touch screen control station provides intuitive software tools for generating superior image quality with a few easy steps. This compact, single bay reader is designed with dependable, high quality components to ensure system reliability. Nano CR will satisfy a broad range of needs from those of a large hospital facility or imaging center, to that of a stand-alone clinic or surgery center. Whether it is networked with another Nano CR, an Xpress CR, or the REGIUS DR system, Nano CR delivers speed, workflow, and redundancy. World’s Fastest Dual-Bay CR System. Xpress CR, the latest break-through in CR technology, delivers unsurpassed total performance in workflow, image quality, and configurability. No longer limited by the single-bay or multi-bay choice, you can customize your Xpress CR configuration to fit your specific clinical workflow, while meeting your throughput, redundancy and budgetary requirements. Designed with high reliability and easy serviceability in mind, Xpress CR is a major leap in CR technology. Power Consumption: 100VA max during operation: 20VA when not in use. With storage capacities up to 2TB, ImagePilot can archive up to 300,000 images on our expandable servers. And this can be expanded even further with add-on storage.